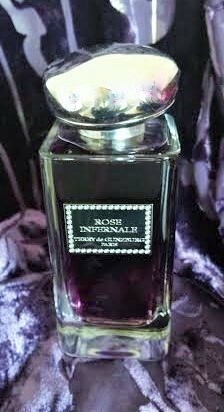 Oh my goodness – what to say about Rose Infernale by Terry de Gunzburg! It’s not so long ago that I didn’t know a thing about Terry de Gunzburg. In fact, I only started to hear a little about her when I discovered the delights of Space NK and the gorgeous if extravagant By Terry cosmetic range. Thing is even then I thought that Terry was a man. Yes I know, I’m an idiot. But that’s what comes from earning a pittance as a civil servant and not mixing with the kind of people that only buy the very best. So I can tell you, this fragrance is exquisite. The liquid is dark, mysterious and purple – it looks as though it’s a potion that Malificent would create to cast a spell. It’s contained within a magnificent bottle, heavy and expensive – it ticks all the boxes for me. Described as oriental avant-garde, floral,smoky and spicy this fragrance melts together Indonesain Nutmeg, Turkish Damasena Rose, Somalian Frankincense and Haitian Vetiver. Reading the descriptors above, I expected something overpowering and heavy and so I was surprised to encounter a scent that evoked a faint memory of an Egyptian holiday where perfumes and spices intermingle and linger on the breeze as you past through the bazaar. And yet it’s more gentle than that, lighter more sophisticated. It’s certainly hard to pin down, it lingers on the skin but doesn’t assault the senses. This is definitely a class act. I would expect nothing less from Terry de Gunzberg in her quest for Opulence and voluptuousness. 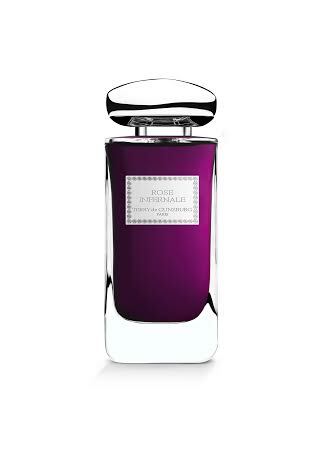 It’s available to buy at House of Fraser and Selfridges for £127.00 for 100ml. Have you got any special By Terry products? Are they worth the hype? OMG I die. The colour, the bottle, the description – adore Turkish rose and vetiver. I’m going to have to go and sniff this and think of who I can sell a kidney to. you lucky lucky thing. enjoy! Sounds lovely. Thanks for the recommendation!